Twenty-one years after they were driven apart by circumstances beyond their control, two former lovers have a chance encounter on a Manhattan street. What follows is a tense, suspenseful novel about enduring love. 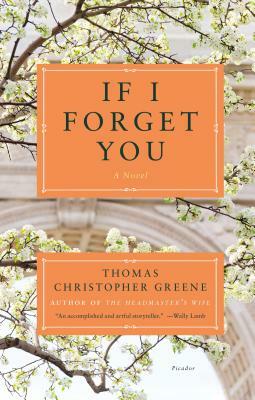 Told from altering points of view through time, Thomas Christopher Greene's If I Forget You tells the story of Henry Gold, a poet whose rise from poverty embodies the American dream, and Margot Fuller, the daughter of a prominent, wealthy family, and their unlikely, star-crossed love affair, complete with the secrets they carry when they find each other for the second time. THOMAS CHRISTOPHER GREENE is the author of Mirror Lake, I'll Never be Long Gone, and Envious Moon. His fiction has been translated into eleven languages and has won many awards and honors. In 2007, Tom founded the Vermont College of Fine Arts, a top fine arts college, making him the youngest college president in America at that time. He lives in Montpelier, VT, with his family.